The people who occupy the new luxury towers springing up in Long Island City love their glittering views of the Manhattan skyline across the East River. When I look at Long Island City’s skyline, I see coffin nails. Sure, some of them reach 50, 60 stories high, and they’re just as chic and glittery as anything Manhattan has to offer. But they are coffin nails nonetheless. It takes awfully big nails to bury a city like New York alive after all, and an awful lot of them too. But the city’s wealthy developers have been busy. Forty-one new buildings containing over 12,500 new rental units went up in the Queens neighborhood just last year. And if these nails in New York’s casket happen to be glittery, well, all the better for pricing out the poor and working class. When the news broke on Nov. 5 that a whopper of a coffin nail could be headed all the way from Seattle to Long Island City, it promised landlords and developers one hell of a payday. “It’s the biggest success for New York in ten years,” Eric Anton of the brokerage firm Marcus & Millichap told the Real Deal, assuming Amazon, which has Queens in its scopes as it prepares to launch its second North American headquarters, pulls the trigger. New York’s governor has offered to rename himself Amazon Cuomo to bring the company here. He has also offered it hundreds of millions of dollars. Jonathan Bailey of the Queens Anti-Gentrification Project and the Democratic Socialists of America (DSA) had a slightly different take. “We’re going to see massive displacement and grave damage to our democratic institutions as well,” he told The Indypendent. Amazon’s 500,000-square-foot sarcophagus-inducer will likely split in two as it hurdles this way from its northwestern launchpad, with one half busting into Crystal City, Virginia, across the Potomac from Washington, D.C. and the other hammering down near the eastern terminus of the Queensboro Bridge. The asking price for rents in Long Island City has already practically doubled over the past ten years, from $35 to $65 a square foot. But Bailey is concerned not only about gentrification, but the political power Amazon and the developers who stand to profit from its arrival will wield. When Amazon’s hometown of Seattle enacted a so-called “head tax” of $275 per employee on businesses that gross more than $20 million a year, the company threatened to spend lavishly to unseat City Councilmembers who backed the measure, and an Amazon spokesperson hinted that it might even leave Seattle. The tax was repealed in June. Here in New York, Amazon’s arrival will further enrich our moneyed real-estate lobby, already the object of much kowtowing by local and state politicians, just as rent regulations come up for renewal next year. Gov. Andrew Cuomo on Nov. 5 offered to rechristen himself “Amazon Cuomo” to bring the company to New York, as well as renaming Newtown Creek, the polluted waterway that separates Long Island City from Brooklyn’s Greenpoint neighborhood, in its honor. He has also offered Amazon hundreds of millions of dollars in subsidies. Exactly how much taxpayer loot the trillion-dollar company and its multibillionaire CEO Jeff Bezos would receive is not public knowledge. Nor has there been the slightest suggestion from Amazon Cuomo that he might consider chopping those hundreds of millions in half. That would seem a reasonable expectation, given that Queens would receive only half of the proposed HQ2 and, presumably, only half the 50,000 middle- and upper-income jobs that will allegedly come along with our dough — “mostly jobs for people who could already get jobs,” points out Samuel Stein, an urban planning specialist at the CUNY Graduate Center. “We’re actually subsidizing the process of creating more homelessness, paying to create the conditions in which our current homeless crisis will become much worse,” Bailey warns. Amazon-fueled gentrification is widely blamed for a homelessness epidemic in Seattle, where rising rents have led to about 12,000 people living on the street or in shelters. 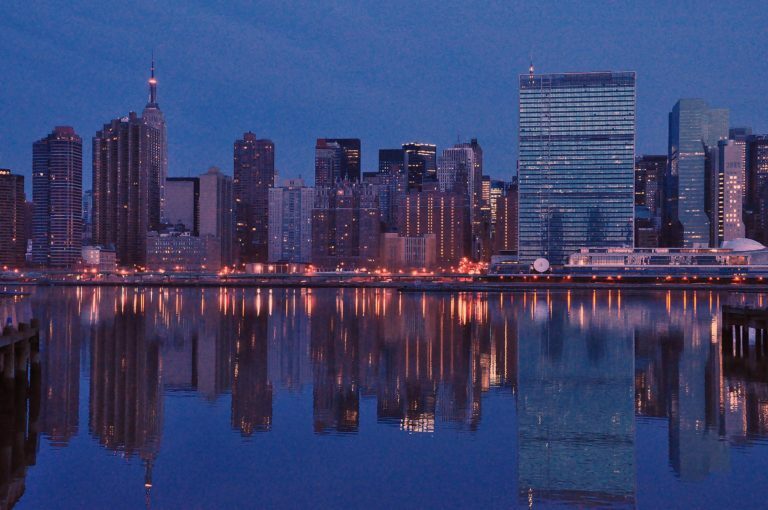 In New York, one in 128 people are homeless on a typical night. 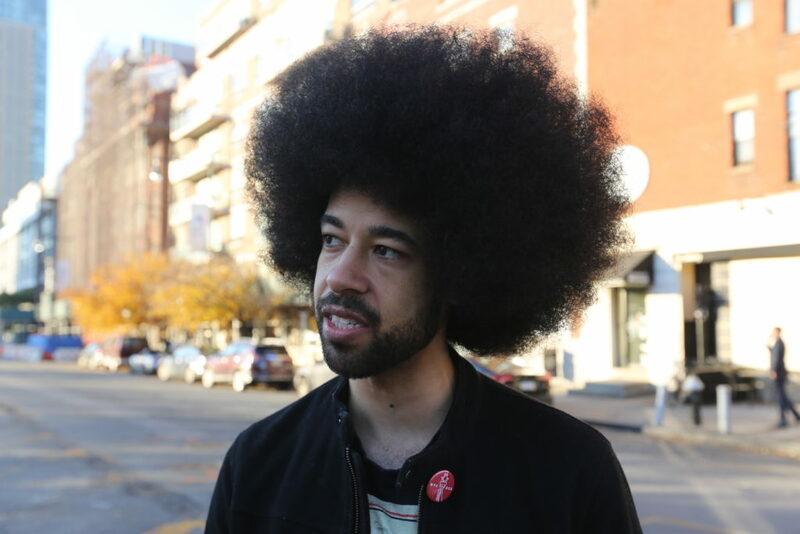 Jonathan Bailey of the Queens Anti-Gentrification Project and DSA. Credit: Elia Gran. Ironically, the conditions that have helped spawn the luxury buildup in Long Island City — which made it an attractive target for Amazon — were created in the name of affordability. At a cost of $1.4 billion in foregone taxes, developers have been taking advantage of the state’s 421a program, which grants them tax-exempt status for 10 to 40 years as long as 20 percent of the new units are “affordable,” based on the city’s area median income — a dubious metric, given that it includes incomes from the affluent surrounding suburbs. Last year, Mayor Bill de Blasio called for Long Island City to be upzoned as a part of his “affordable housing” plan — more luxury housing in return for a pittance of units available to low-income renters. Long Island City residents have the added misfortune of living in an “opportunity zone.” Instituted as part of President Donald Trump’s tax cut last year, the opportunity zones offer lucrative federal tax breaks to companies that invest in poor neighborhoods. The idea goes back to Margaret Thatcher’s Great Britain, but in its current U.S. iteration, university campuses, military bases and even a golf course owned by the president have fallen under opportunity-zone status. So has 60 percent of New York State, including much of Long Island City, based on plans submitted by the Empire State Development Corporation and approved by Gov. Cuomo. When Amazon sets up shop, it will pay zero capital gains tax for seven years. Neither will developers in the surrounding area, whose property will skyrocket in value thanks to Amazon’s presence. Once they sell, they won’t have to pay taxes on their profits either. Nor will they be required to hire union labor. Speaking on the Brian Lehrer Show on Nov. 7, state Sen. Michael Gianaris of Queens declined to take a position on HQ2, but said he had “real questions” about the subsidies Amazon would receive, the company’s impact on housing and the burden its arrival would place on the city’s transit system. It’s not just its views of Manhattan that make Long Island City an attractive place to live and work, but the 13 bus lines, eight subway stations, two Long Island Railroad stops and the ferry dock it harbors. There’s also a potential tramline, the Brooklyn-Queens Connector, that the mayor has touted and which would likely get a political boost if Amazon arrives, possibly making it one more public benefit for Bezos and his company to milk. Bailey cautions that even New Yorkers who don’t live in Queens will be buried alive in higher rent and — though Amazon might not be feeding the till — taxes. 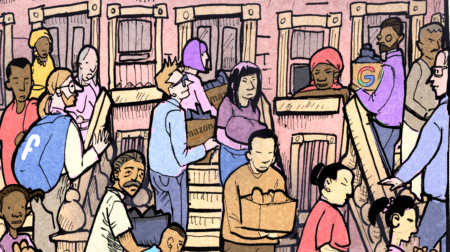 The Queens Anti-Gentrification Project is still formulating a plan to fight back, but right now, “it is super-important for people to get involved,” Bailey said. As he and other housing activists girded themselves for Amazon’s arrival, the Wall Street Journal reported that Google plans to mop up 1.3 million square feet of office space on lower Manhattan’s west side. CORRECTION: In the print edition of this article the Queens Anti-Gentrification Project is misidentified as the Queens Anti-Gentrification Network. Photo (top): Amazon’s expected arrival could be another nail in New York’s coffin. Credit: Juan Beltran. 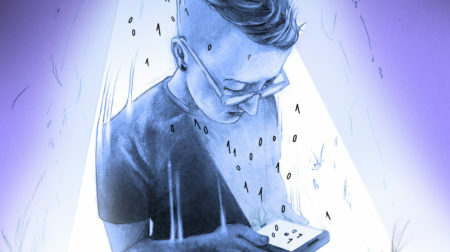 Facebook is using our personal info to manipulate us. Can we stop it?